First of all, HAPPY NEW YEAR! I for one am glad to have 2012 behind me, and am looking forward to making some real indentations in the rut I’ve managed to land myself in of late, particularly with my writing (one of my resolutions is to have some of my original fiction published in something before the year ends). If characters don’t change–not just the main character, but secondary and even tertiary characters too–then what’s the point? And I’m not just saying that to be obvious, I’m saying it because sometimes it’s one of the hardest things to get across, especially if the story being written’s getting bogged down with terribly clever plot devices and witty tangents and glitzy quirks and and all those other “whistles and bells”. 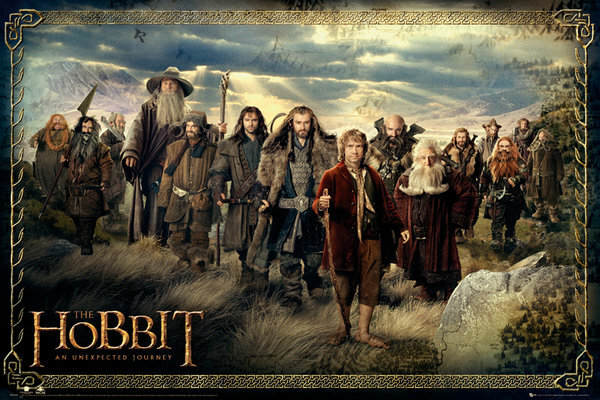 What transpired to inspire me to post this was my having seen The Hobbit: An Expected Journey in theaters this past December. This is part of what made J. R. R. Tolkien a great writer: not just that he could write a massive work like The Lord of the Rings Trilogy (and still have it follow through in the tradition of a great tale), but because he took a protagonist and gave him a very simple, rather humble change in them–in the case of The Lord of the Rings, that change comes in the protagonist Frodo Baggins, as well as in Aragon the once and future King of Gondor, and even Middle-Earth itself, in viewing setting as a character. In The Hobbit, the change comes in the protagonist, Frodo’s uncle, Bilbo Baggins. When we first meet Master Baggins, he’s a relatively solitary sort, who though not unfriendly, is also keen on keeping to a comfortable life full of abundant food (second breakfast, anyone? ), puttering around the guardian, smoking pipeweed, reading his books and maps, and general living a quietly cushioned life without any kind of discomfort. Then along comes a wizard, Gandalf the Grey, proposing he be part of an adventure–and he alludes to having known Bilbo to have thrilled as a child to the idea of exploring distant lands and going on exciting adventures. All that’s been quashed though, perhaps by that kind of wisdom that comes from growing up that childhood aspirations are nothing but foolish fancies that ought not to be lived out if you know what’s good for you, and we see a young hobbit quite reluctant to leave his door. 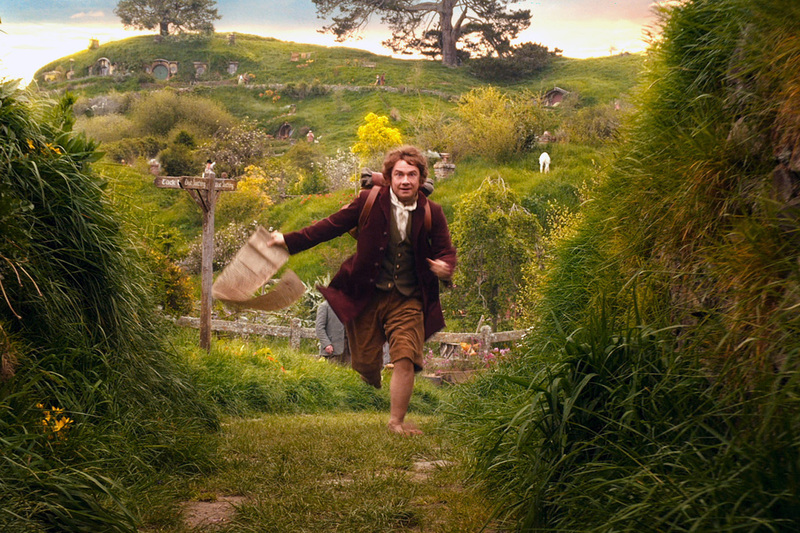 “I can’t just go running off into the blue,” he insists, “I’m a Baggins of Bag End.” In any case, adventures are, “nasty, uncomfortable things,” that “make you late for dinner”. Until of course Gandalf reminds him of his particular ancestry on his mother’s side concerning the heroism of one of his maternal Took ancestor who was big enough to ride a real horse and knocked the head off the goblin king while simultaneously inventing the game of golf at the Battle of Green Fields, and in so doing, the old wizard also reminds Bilbo of the worth of taking part in an extraordinary undertaking that requires not a little honor and stoutness of heart. So it is that Bilbo, at quite literally the last minute, decides to help the dwarves with Gandalf on their quest to reclaim their homeland of Erebor, the wealth of which has been lost to the greed of a dragon, the fearsome Smaug the Terrible. At the beginning, he gives the impression of the odd one out, or in fact, the bookworm among athletes, experiencing a charming allergic reaction to his pony, which is not far out of logic since he’s never been beyond Hobbiton before, no less he’s never been much for riding ponies. To me it was almost reminiscent to the movie Stargate, where Martin Freeman’s Bilbo is to James Spader’s character as Thorin Oakenshield is to Kurt Russell’s. Spader’s character even sneezes too on account of allergies (or rather, ridiculous sensitivity to changes in environment). And for most of the trip in this first installment of the three films into which the book this is based on is being broken up, Bilbo is, admittedly a bit of a drag to the rest of the company, though some of the dwarves warm to him, but Thorin Oakenshield, heir to the throne of Erebor, remains unabashedly skeptical. Then they manage to get captured by a gaggle of goblins, though Bilbo manages to get passed over and give them the slip, only to get waylaid by a goblin that’s fallen behind as he tries to sneak after the others–perhaps to see if he can rescue them? Bilbo, at this point, isn’t so certain of his courage, and in fact was just about to skive off back home to the Shire when the goblins came upon him and the dwarves. But then he’s forced to defend himself against this goblin who’s fallen behind, inexpertly waving about his newly-obtained sword, which has yet to be dubbed, “Sting”, likened at this point to nothing more than a “letter opener” (marketing ploy, anyone? 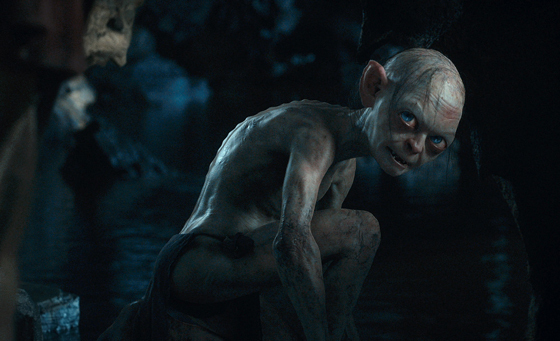 ), and he and goblin both end up tumbling over a precipice and falling into the clutches of the cave-dwelling Gollum. The goblin suffers the unfortunate fate of getting its head bashed in by Gollum, but Bilbo’s a bit luckier. Gollum has a mind to eat him of course, but Bilbo, the desire to survive and get out of the cave paramount, draws water from a well of resourcefulness within himself, and ends up challenging Gollum to a game of riddles–if Gollum wins, he gets to eat Bilbo, but if Bilbo wins, Gollum has to show him the way out of the cave. 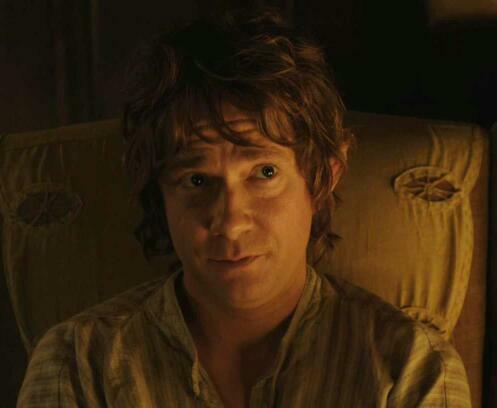 Along the way, Bilbo’s managed to pick up a ring that Gollum managed to lose. Of course, this is the One Ring, the one that will play into the plot come the storyline of The Lord of the Rings Trilogy, so we have to admire director Peter Jackson’s setting the stage for all of that with these Hobbit films, particularly with putting in Gandalf’s going against the Necromancer, which is in fact Sauron planning his return to power–it’s where he goes in the book when he disappears until later on when he returns for the big battle at the end. At the moment however, the ring is of little consequence. 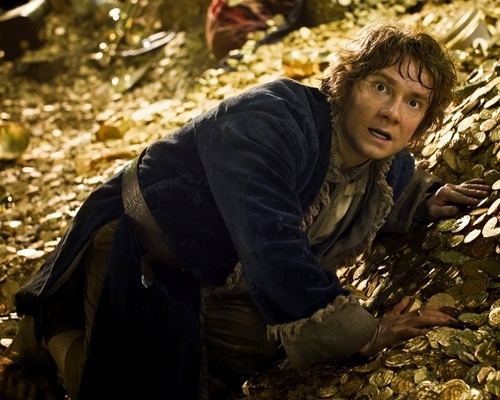 Bilbo’s picked it up as anyone might pick up a shiny penny they find on the street. But to Gollum, that ring has consumed him to the point that it means everything and more to him, it’s become his “precious”, and during the course of his and Bilbo’s riddle game, when he realizes not only that it’s gone, but that Bilbo has it, there’s only one thing for it in his mind: the nasty hobbit has stolen his precious, and must be killed for it. 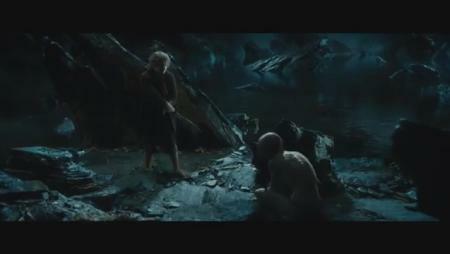 Seeing that Gollum is most certainly not going to let him live now, Bilbo has no choice but to trust his own instincts in the cave and make a run for it. While making his escape, the ring ends up on his finger and reveals to him its power to make him invisible, and then he sees the dwarves and Gandalf (who once again came to save the day, this time from the likes of the goblin king and his minions) running out of the cave. He makes to follow them, but there’s Gollum to contend with, and Bilbo is in a perfect position to strike him dead, which would remove any danger the creature would pose otherwise. 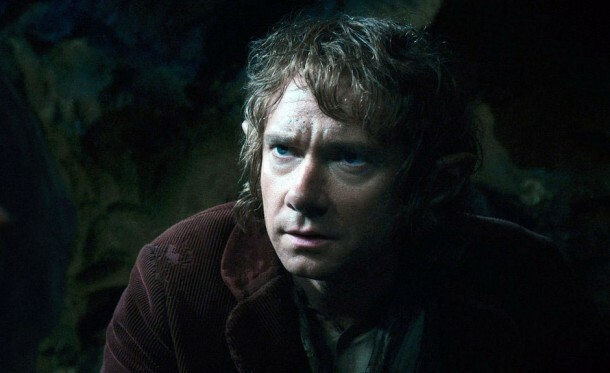 But just as he’s about to lay on the unsuspecting Gollum the killing blow, Bilbo has a change of heart. He recalls Gandalf telling him that true courage is not in taking a life, but in knowing when to spare one. 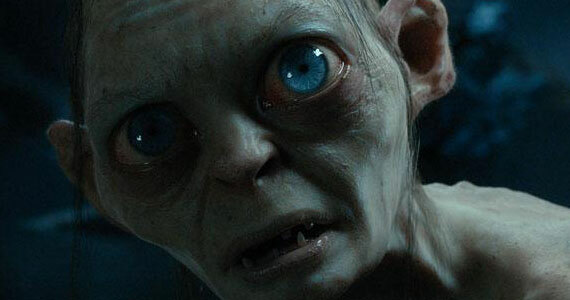 He sees in Gollum’s face one who has become a slave to the ring he has lost, and it is nothing more than a cause for his despair and the way that he is, which evokes a sense of pity in Bilbo. And the fact that Bilbo is already safely invisible notwithstanding, Bilbo withdraws his sword and leaps over Gollum instead, escaping him, but also sparing his life–which if you’ve seen and/or read The Lord of the Rings, you know that from there Gollum in fact plays a key part in destroying the One Ring, which doesn’t I think, say that Bilbo’s sparing Gollum’s life involved any forethought except this: no one can ever know the true consequences of certain actions, and when it comes to actions we cannot take back–like killing for example–it’s not something to be taken lightly or in haste. 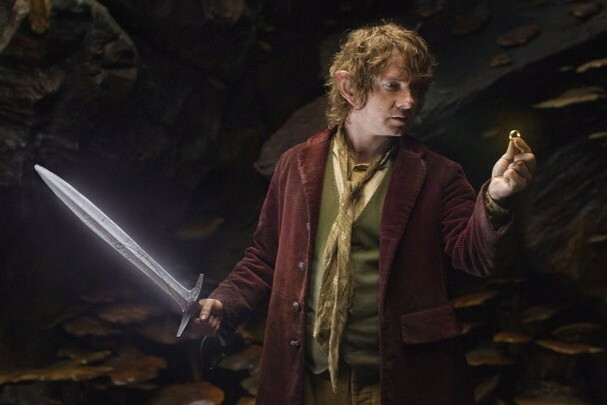 Just because he’s there doesn’t mean he needs a sword run through him, Bilbo just had to escape was all. Not long after, Bilbo and Co. find themselves at the mercy of orcs and wargs just after managing to escape the danger of goblins. The orcs have them trapped on a burning pine about to go over a cliff when Thorin steps forward to seize his chance to avenge the death of his grandfather and the massacre of his people against the mighty Pale Orc, Azog the Defiler. The Pale Orc nearly kills him and orders one of his underlings to take off Thorin’s head, but Bilbo leaps forward and kills the underling orc before he has the chance, and then of course they’re all saved by the deus ex machina of the great eagles who swoop in and carry them away from the danger. Afterward, Thorin, utterly amazed, admits he was completely wrong about Biblo, though Bilbo admits that he too would have doubted himself at the beginning. Now however, he’s turning out to be a much stronger person than he ever thought possible, and for one so small. Naively, of course, he believes that the “worst is behind [them]”, for not only is their still the dragon Smaug to contend with, but there’s also the shadows of Mirkwood, like spiders and wood elves a touch more sinister and impish than those of their High Elf kin. But for all of that, Bilbo has at least proven that even if he isn’t still afraid, he has it in him to contend with any further dangers they might encounter, and they do. The rest of the story, as written by Tolkien, and indeed as it will be followed by the next two films, goes on to test Bilbo even further. Now that he’s proven he’s not entirely incapable of handling himself, and certainly isn’t without a measure of loyalty to his new companions, he’ll grow from there, and not only to contend the likes of Smaug the Terrible. WARNING: for those of you who only plan on watching the movies and have not yet read the books or know anything of the story (like if you watched the old cartoon version, for instance) there are a few spoilers here–mainly that later on, when war is imminent between the elves and the dwarvish company, Bilbo wants no more of that than he wants to see his friends in any other sort of danger, and he knows the futility of what they’re about to do. So in spite of the dwarves’ believe that he has betrayed them, Bilbo in fact acts as an agent of wisdom in order to get the two tribes to come to an understanding, especially when in the end they’re all forced to join forces to defend Erebor, now won at last from the clutches of Smaug. But as far as this first film and section of the story is concerned, one great character arc has been established, very simple, but very effective. And with Bilbo’s change, the other dwarves have changed toward him, most of all Thorin, and those who experience the story as the audience are left with an exhilarating thrill at observing these changes, for they feel changed by it too, feel uplifted by it in some way, in this case at the humble thought that a very small person can take on a very great challenge and come out the other side, and though not unscathed, but certainly with plenty of grace and valor to recommend them. No affecting experience can come upon a person without it changing in some way, and a good change in character through experience is a mark of good storytelling. Tolkien was a master, not just for his ability to evoke changes in the characters he painted, but also in the beauty of the language he used, the poetry of it. But before getting to embellishment, character development is key: if there is no change, then clearly nothing all that important happened, so…why bother reading it? Anyway, I wanted to share that in this post, because I was indeed genuinely affected by how well Jackson has pulled off such a simple story arc as small-town hobbit goes from living a simple, comfortable life to taking on enemies and great dangers in defense of fellow compatriots, translating what Tolkien put forth in the story he first conceived. And I think that simplicity is key, nothing fancy. It just bogs things down. Tell the experience for what it is, and you’ll know when you’ve affected a good change in the character when, at the point that you have them reflect on what’s happened, you feel the change in yourself as well. That being said, I think I’m going to stop there, because if I go on any further, I too am going to complicate a simple point (if I haven’t already). I will just add here that having read the book, and seen the first film, I am very much excited for the next too–especially since once again we’ve got the totally awesome Lee Pace to look forward to! 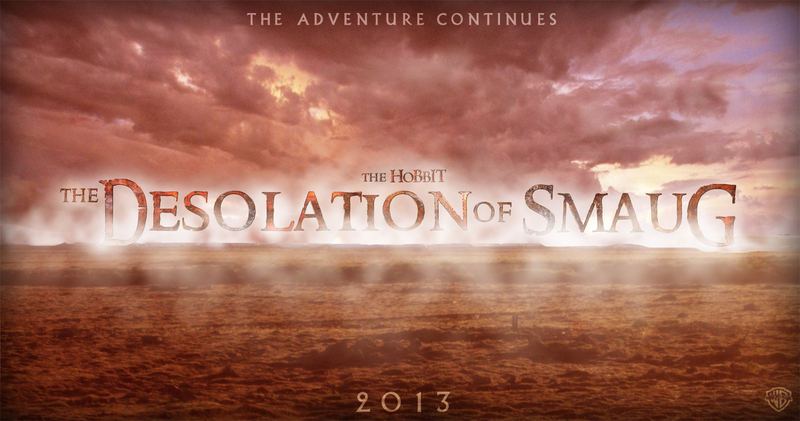 Oh yes, and the “desolation of Smaug” of course.